Frank and Daisy did it again . . . I went out to feed the aviary guys and heard an all too familiar sound . . . Squeaking!! I knew it was from outside so I immediately checked Frank and Daisey's place. Sure enough, Daisey had pulled another fast one on me. I had replaced her eggs but she decided to push them aside and lay her own. We now have two new little ones that will be joining the feral flock soon. 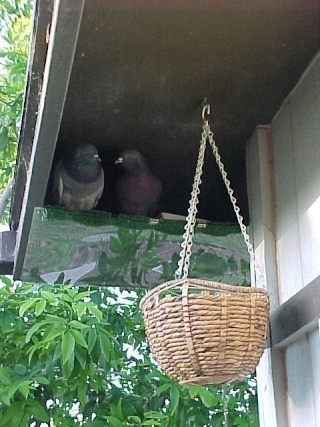 As long as I was up there I decided to clean their area so I put the babies in the basket right outside their place. Figured I may as well get a picture of the little doll babies before putting them back. Daisey had laid her eggs and I replaced them, but I guess she wanted her own eggs this time around. They really are just too adorable . They are both very alert and healthy appearing. Frank and Daisey are such doting parents. Indeed they do. Ya gotta love 'em. 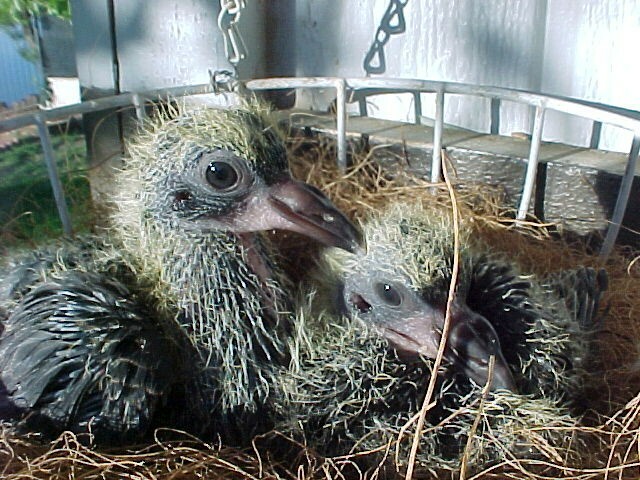 Oooooh, baby pigeons! I'm in love!! I simply cannot resist the little squeakers! What beautiful babies. There are a lot of humans who could learn a good lesson if they would just take the time to really watch the behavior of pigeons. You are so right, Petra. These are two ferals so interacting with them is out. BUT, we do get to watch them grow. And they have definitely grown. When we enclosed the patio we built Frank and Daisy (the parents) a home right on the other side of the enclosure. They are safe and secure and I can keep an eye on them. Here's a picture of Frank and Daisy in their new home. * what a sweet photo. ** That place looks extremely cosy and they are completely free to leave and come whenever they want to. In my opinion the ideal environment. ** We had some pretty fierce storms not long ago and they were as snug as a bug in a rug. *** I wish we were able to afford all the ferals such security. Frank is very special to us. Eight years ago Chuck picked up him and his mate (after three attempts of being detoured due to snowy weather) in Denver, Colorado (900+ miles from us) and brought them home. It's suspected that both had been shot in the wing while flying as their wounds were nearly identical. Same wing, same entrance spot. They were found grounded near a lady's barn. She took them in and cared for them, but was unable to keep them. We offered to take them and Chuck was thrilled to be able to pick them up on his way home from the east coast. That's a cute picture of Frank and Daisy. I agree with Petra...it does look like a cozy place. Especially on a cool, cloudy, drizzly/rainy, windy day. That really is a nice little home they've got there. Safe and secure. Lucky birds! How are those cute little babies doing? That really is a nice little home they've got there. Safe and secure. Lucky birds! How are those cute little babies doing? They're doing great, Jay. Thanks for asking. 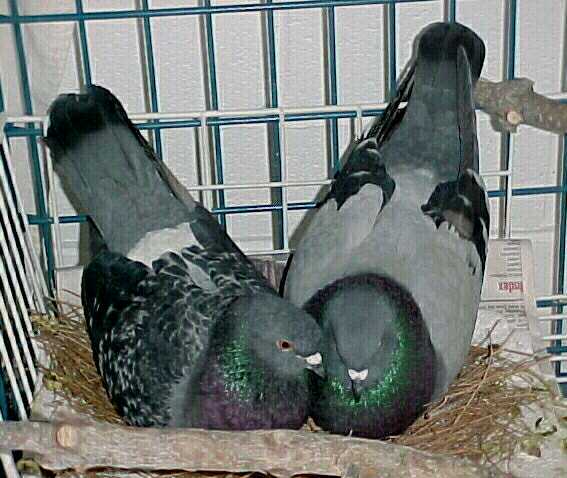 It's getting a bit crowded upstairs so I brought them down and put them in the 'daycare' cage for a while. I mainly wanted to see how they would do on their own. And they did great until the littlest one saw Dad wandering about in the yard (I had them inside the patio). So I took them back home and doting Dad went up and fed them. 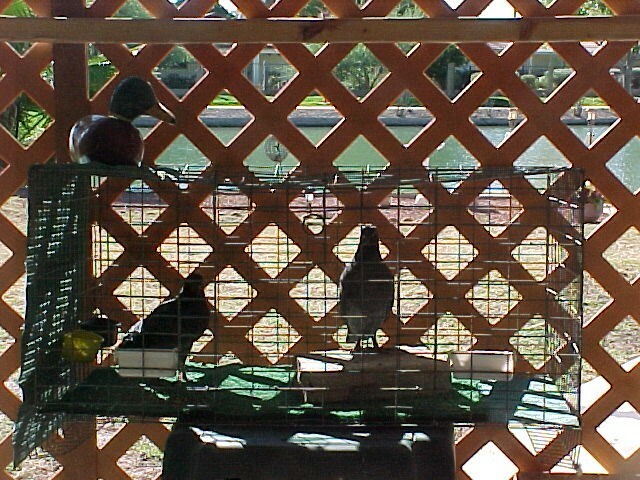 I reseeded the yard on Sunday and I think the regulars rounded up just about every pigeon in Mesa to come on over. They will be good for the little ones to see but at the same time they're having a field day eating the grass seed. While they were in daycare they did eat a few seeds. This isn't the best picture but you can at least see how they've grown. Wow, they have grown! If you want them to learn to eat seed, just put them out on the newly seeded lawn with all the others that are coming for it. They'll learn real fast!I never reseeded my whole lawn, but when I had to reseed bare spots, or areas, after laying down the seed, I always sprinkled peat moss over it all. The pigeons would watch me the whole time from the roof, and when I was done, they would make a mad dash for the seed, but couldn't find any, and would give up. The peat moss hides it from them, it also helps to keep it moist longer when you water, and when the grass grows, it grows right through it, and the peat moss then becomes a mulch for the young roots. Always worked great, and I didn't have to fight off the pijjies. LOL. ** I always sprinkled peat moss over it all. 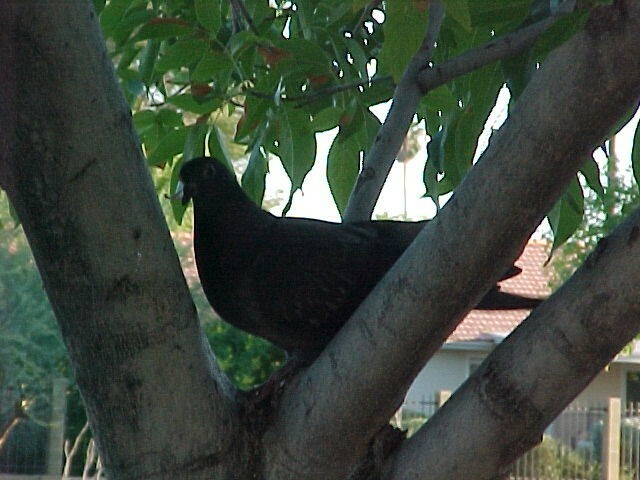 The pigeons would watch me the whole time from the roof, and when I was done, they would make a mad dash for the seed, but couldn't find any, and would give up. The peat moss hides it from them, it also helps to keep it moist longer when you water, and when the grass grows, it grows right through it, and the peat moss then becomes a mulch for the young roots. Always worked great, and I didn't have to fight off the pijjies. LOL. * No worries. They are both eating seeds on their own. The one thing I don't need is two more pijjies feasting on the new seed. ** Oh I did that! Always do. Yep, the birds sat on the roof watching me just as they did with you. But they didn't even wait til I was finished spreading the seeds. I was able to get the covering over the seed but they don't even care about it and there's no way the are going to give up. I'm sure they are getting some of the seeds. Speaking of the little ones. The larger of the two flew the coop today. I went out to feed the aviary guys, but decided to feed frank and the family first. 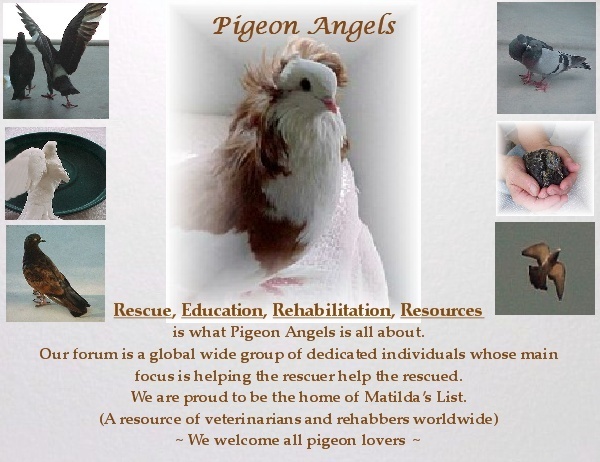 I saw Frank on the ground with another pigeon who looked like Daisey but too young. It was the 'baby'. Frank flew to the roof and the baby followed. He first flew to the tree and then on to the roof. Frank flew back home leaving the baby behind. I was concerned that he wouldn't find his way back home but to my delighted surprise he did. Maybe they thought you were spreading seed for them? Nice picture. Glad he found his way home. Glad he found his way home. It's kind of tricky getting into their home. Frank and Daisey first fly to the basket and then up to their place. Subject: Re: Frank and Daisy did it again . . .